They’re back again! 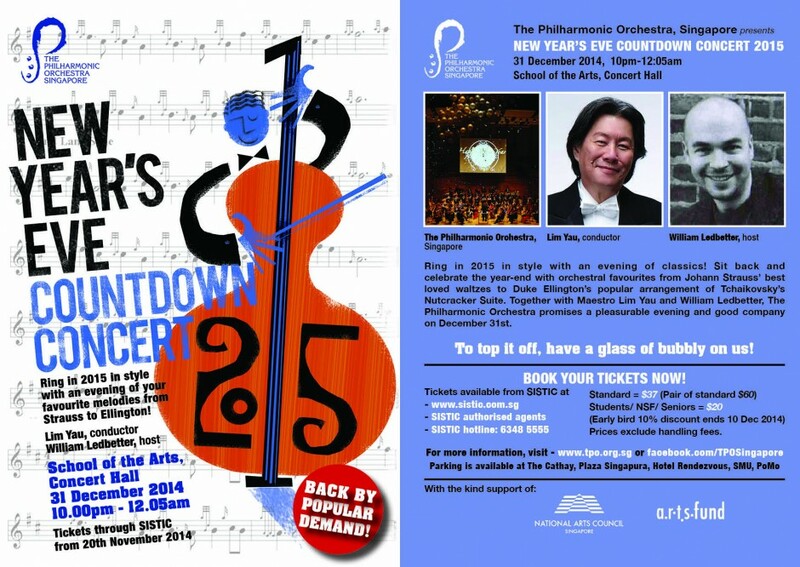 The Philharmonic Orchestra is having their New Year’s Eve Countdown Concert yet again, so if you don’t want to be jostling with the crowds at Siloso Beach or around the Esplanade, then why not join TPO in the classiest way to spend the countdown? So ring in 2015 in style with an evening of classics! Sit back and celebrate the year-end with orchestral favourites from Johann Strauss’ best loved waltzes to Duke Ellington’s popular arrangement of Tchaikovsky’s Nutcracker Suite. There’s also some movie music, and watch and countdown with the Orchestra as they play Respighi’s exciting Pines of the Appian Way as the clock strikes midnight! Led by Maestro Lim Yau and hosted by William Ledbetter, The Philharmonic Orchestra promises a pleasurable evening and good company on December 31st. Tickets available from Sistic, $37 for one and $60 for a pair. ps. Look, they’re featured here as one of Straits Times’ best parties to countdown!